My grandmother was the second-to-the-last child in a huge Irish family. When her parents died, she and her husband, Doc, the optometrist, inherited the three story Victorian house with the wrap around porches. Along with the house came the bachelor uncles, the youngest of whom, Uncle Bernie, still lived there when I was a child. On Sundays when we got to our grandmother’s, we’d run into the parlor where Uncle Bernie stood waiting for us, hands in his pockets. He shuffled his slippery shoes on the carpet. Do you see one? Is it there? With pantlegs flapping to his clumsy footwork, he flicked Necco wafers out of his pockets. Sticks of Beeman’s gum. Pennies occasionally. We danced around him and begged for more, laughing up at the dome of his Santa Claus tummy. Uncle Bernie was different before The Depression, they said. He lost all his apartments in The Crash. Not that he wasn’t still in Real Estate. Sometimes he’d rush away from my grandmother’s dinner table, saying, “I have to go show a house.” He wore a three-piece suit every day and always drove a Cadillac. My grandmother’s albums had pictures of him during The War. That would be World War I, when she was young and knit so many socks for the men in the trenches. In every one of those photos, Uncle Bernie stands in uniform, beside the elephantine haunches of an automobile. Uncle Bernie drove the general’s Cadillac. Uncle Bernie didn’t read to us or play games of cards like my grandfather did. But on Sundays he let us sit on the toilet seat or the edge of the bathtub and watch him get ready for church. He sudsed up a brush in a cup the same way our dad did. The lather all over his face made him look even more like Santa Claus. We’d kick and bounce, call for him to dab us on the nose, expecting the taste of whipped cream, even though we knew it was soap. The aftershave was Old Spice. He slapped his jiggley cheeks with it, shook his head, said “Bwwrrrr” with his lips flapping. Then the white goo from the tall bottle. He smeared it onto his palms and into his hair. The comb left tracks front-to-back through his white widow’s peak. He was headed for 12 o’clock Mass. No way us kids could go to 12 o’clock Mass. We went at 7:15 or 9:30. 12 o’clock Mass was for people who were lazy. And Uncle Bernie. You didn’t ever get to do something just because Uncle Bernie did it. At dinner, he ate his dessert–a bowl of custard–first. My grandmother made his plate up special in the kitchen. The meat had to be extra-well-done, black. He wouldn’t tolerate spaghetti, because it looked like worms, nor could he bear the sight of a green bean because there could be spaghetti or a worm hidden inside. Uncle Bernie’s cure for any ailment was bicarbonate of soda. Sometimes my mother and the aunts would exchange murmurs and glances when he spent a long time in the bathroom after dinner. 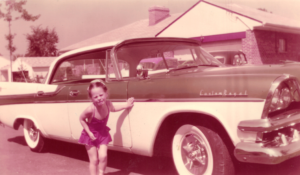 There’s a famous family photo of me in a wet bathing suit, cringing beside the rear bumper of Uncle Bernie’s Cadillac crying, “I caaaaan’t.” Outside the frame, he bows over the box camera at his belly, tells me to straighten up, stand still, and smile. Uncle Bernie wouldn’t think of bare feet and hot asphalt, only that one of those kids in the wading pool by the driveway should and get over here next to his Cadillac for a picture. Uncle Bernie spent his weekday evenings at a funeral parlor. Hanging around with his friends in the back of a funeral home was just one more oddball thing Uncle Bernie did. Uncle Bernie. He drove the general’s Cadillac.